Ho, ho, ho, now I have a CNC machine. Yes, after years of using other people’s CNC machines I finally bought one of my own. A big one. A 4’x8′ ShopBot to be exact. Now I can build more of everything and hopefully even sell kits / cases in the future. In other news, after a shaky truce The Pinball Wars have begun anew. 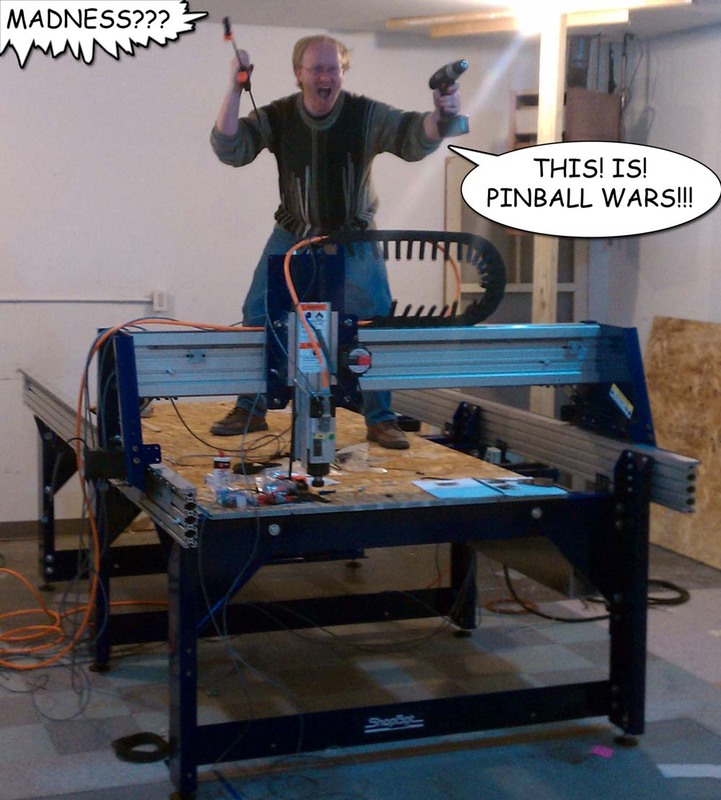 Pinball upstart “The Longhorn Engineer” is attempting to have his machine done by the Midwest Gaming Classic in March. It is called “Reset Vector” and is based off all of the tropes in crappy hacker movies. Also everyone’s favorite ex-Roller Derby girl / engineer Jeri Ellworth hasn’t given up on her custom pinball either. It’s called “As Seen on TV” and celebrates the world of cheesy infomercials. For myself, I am planning at least 2 new machines. “Tesla VS Edison” and “Lost“. “Lost” is an unlicensed one-off that I’m doing for a friend, similar to Paxton, but “Tesla” is something I’m hoping to build 2-3 of and sell to interested buyers. If you’re interested please let me know. Be sure to check out the latest episode of The Ben Heck Show for an exclusive tour of my shop and home, as well as other hi-jinks.